Christmas has passed, it was wild. Amongst the many great experiences of Christmas like spending time with family and friends, I received a gift of The Happy Pear Cookbook. This book is brimming with simple vegetarian recipes and I am working my way through it each week. This week I made the “Puy Lentil Pesto Bake with Sweet Potatoe Mash”, I made one alteration I used Sweet Potatoe & Cauliflower Mash. I also used 200 grams of puy lentils instead of 400 grams. In my opinion this dish tastes like a Shepherds’ Pie minus the mince. It is great to have in the fridge, very convenient for lunches or a quick snack. 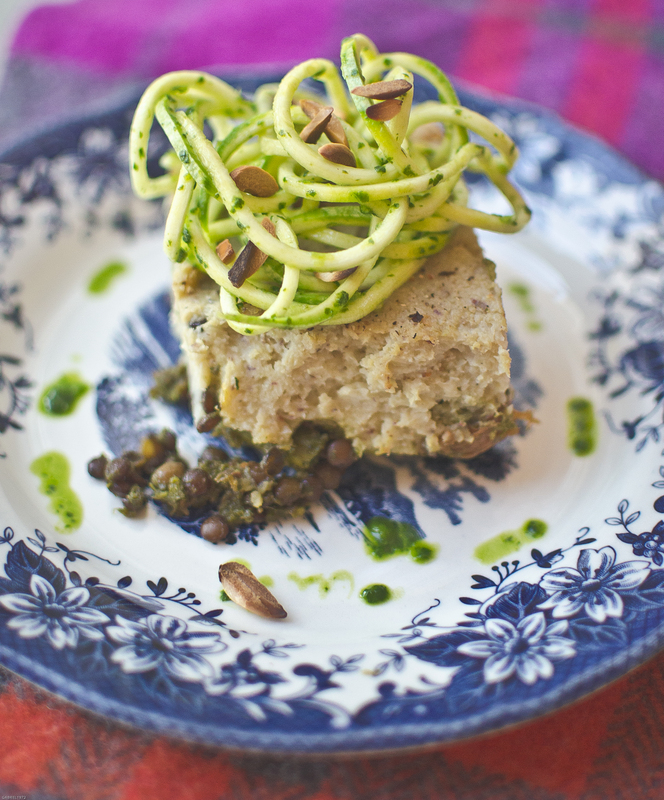 I served it with zoodles and drizzled pesto and almonds on top. Coriander: good source of iron, magnesium and manganese – fresh coriander is delicious. Sweet Potatoe: packed with vitamin A, beta-carotene, vitamin C, B6, manganese, potassium and fiber. Cauliflower: low carbohydrate content, source of fiber, vitamin C, B vitamins, biotin and folate. To learn more about vitamins visit the Linus Pauling Institute. * Pop all ingredients in food processor and blitz until smooth, pour into a storage jar. Wash & Chop: carrots, green beans, cauliflower florets, cube sweet potatoes leaving the skin for extra fibre. Rinse: Puy lentils and pop them in saucepan with carrots, bay leaves, thyme, tamari sauce, 500-600 ml water, season with salt & peppers. Cooking time: 30 minutes. Oven: Pop chopped cauliflower on a tray , drizzle with oil roast at 180 degrees for 20 minutes. This will be used for the mash. Saucepan: add cubed sweet potatoes, cover with water and cook until soft. Pesto: mix 3-4 tablespoons through the lentil mix. Pyrex Dish: Pour lentil mix into a square Pyrex dish (25 cm x 25cm) and top with mash. Bake in the oven for 30 minutes at 180 – makes it nice and crispy. Grotto. D, RD, LDN. (2001) 101 Foods that could save your life. Bantam Books. New York.